Select some text on the page and make sure that the Common category of the Insert panel is forward. Click the Hyperlink button. You can also choose Insert→Hyperlink. 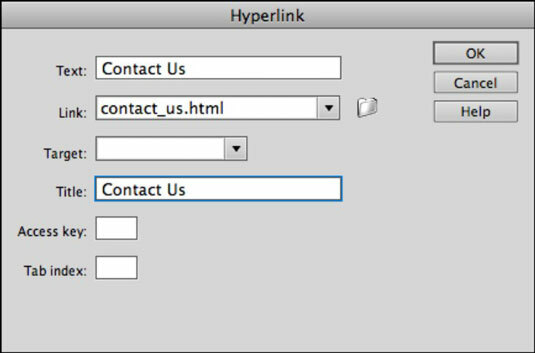 The Hyperlink dialog box appears with your selected text already entered in the Text field. You can either enter a URL manually (such as the location of a page or file) or click the Browse folder icon to the right of the Link drop-down list and browse to the file you want to link to within your site’s root folder. You can also enter an external link here. If you want to force the link to create its own new browser window, choose _blank. Click OK to create your link. The selected text should appear with an underline or another visual indicator to let you know it’s now a hyperlink.